There are many conditions that can compromise the integrity of a home’s foundation. Once moisture and water seep into your basement, it becomes a job for Royal Work Corp. Waterproofing, a company that specializes in interior and exterior basement waterproofing in Toronto and the GTA. Whether it's basement waterproofing in Toronto or sump pumps we can help. So what causes basement leaks and cracks? What are some of the conditions that a homeowner should be aware of, so they know when it’s time to call in the professionals? Homeownership can be an amazing experience, one that so many Toronto families work most of their lives to attain and then maintain. Whether you've been in your home for years or just moved in, you'll want to enjoy every usable space, including the basement. Unfortunately, wet basements can occur in all types of foundations - poured concrete, block walls or stone walls - regardless of age. Instead of worrying that your property or family might be at risk, call in the experts at Royal Work Corp. for a FREE full house basement waterproofing evaluation. 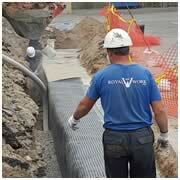 We understand basement waterproofing in Toronto. Cove Joint (Hydrostatic Pressure) - Where the wall and floor meet inside your basement. Hydrostatic pressure can lead to bowing walls and water seepage through the cove joint. Wall Cracks - The two main types of wall cracks are due to shrinkage and settling. Water leaks can occur and repairs can vary dependent on cause, size and location. Floor Cracks - Shrinkage and settling can also cause floor cracks but are rarely cause for concern. Some remedial action is available to reduce further cracking. Clogged Drain Pipes - Slow draining or totally blocked plumbing fixtures can be caused from clogged drain pipes. A build-up of grease, hair or foreign objects can be easily corrected. Exterior main drain problems can be more serious and require specialized equipment to repair. Leaking Sump Pump Pit - If your sump crock never seems to empty and your sump pump is constantly running, your pit may be damaged or incorrectly installed. Let a pro look at it to prevent premature pump burnout or possible flooding. Basement waterproofing is essential to good home care. Leaking Window Well - Below-grade windows are often protected with a window well. If the drain is blocked by debris or not draining properly, excess water can pour into your basement. Mold and Mildew - This can be a major health concern for your family. Mold requires humidity to grow, so you'll need to lower the moisture content in the air. Sump Pumps - The sump pump is the most powerful defense in basement waterproofing. Excess groundwater fills the sump pit and the sump pump automatically turns on to pump and safely redirect the water away from your foundation and basement. Interior Drainage Systems - Interior basement waterproofing can be provided with the installation of drains and pipes under the basement floor around the perimeter of the room. This provides a route for water to flow directly to the sump pump and outside. Exterior Weeping Tile Systems - Excavation and a complete inspection of your drainage system and replacement of clogged, damaged or worn weeping tile sections will provide a long-term exterior basement waterproofing solution. Foundation Wall Membrane - Even though your foundation wall is made from a seemingly solid material, concrete is actually quite porous. The installation of a foundation wall membrane system on the outside or inside can act as a vapor barrier to prevent water and moisture from passing through to your basement. Royal Work Corp. Waterproofing Can Help! Our licensed and insured professionals are prepared to deliver high-quality, fast service at a price you can afford. We are Toronto's leading basement waterproofing service. With a 100% SATISFACTION GUARANTEE, there's no reason to wait another minute. Be sure your home is protected, call today for your FREE Problem Evaluation and FREE Estimate. We specialize in diagnosing moisture and leak problems so we can offer the best solution for a watertight basement over the long term. We are also known as walkout basement contractor in Toronto area. Since our day one we build basement walkouts for homes in GTA. Royal Work Corp. Waterproofing Toronto is proud of its reputation as one of Canada’s leading foundation repair and building contractors.